Depending upon what you read, the numbers of wild horses in America can be as few as 20,000 and as many as hundreds of thousands. Hundreds of websites, though — depending upon their respective positions in this issue — routinely reduce or expand these numbers, leaving the horses horribly maligned, misrepresented and unfairly targeted. The BLM has stipulated, repeatedly, that there are 22,000 horses and 3,500 burros remaining on the open range. This is a mere fraction of the number remaining even as recently as 1971 when the Wild Horse and Burro Protection Act, providing protection from harm, was originally penned. In 1900, the numbers were estimated to be 2 million. These animals — as difficult as it is for some to accept — are absolutely being targeted for destruction. Most believe these decisions are being made simply as a matter of convenience, to appease America’s ranchers, numbered at about 800,000. This story, which ran recently in the Arizona Republic, delineated the reasons the horses already rounded up must be eliminated — despite the upraised voices of the public. So, is it related to the beef industry? Most certainly. 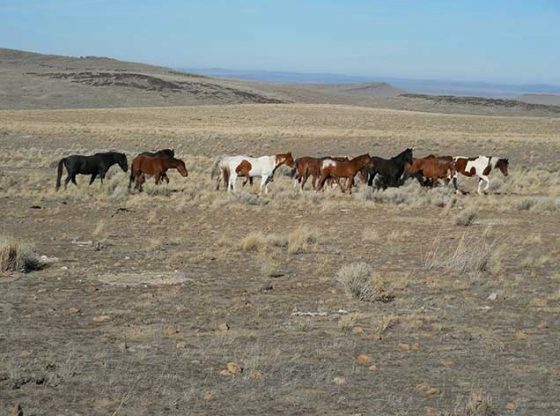 Beef producers, of course, insist that the grazing permits they’ve obtained, at a price, from the BLM should not include sharing the lands with horses or burros. This is unfair, unjust and must be rectified. It has already cost tens of thousands of lives and is slated to cost tens of thousands more. One ranching family that has demanded the removal of horses from their grazing lands might seem familiar: the Bundy family. Although they received hundreds of thousands in subsidies, they famously refused to pay their grazing permit bills resulting in a disastrous debacle that saw other men killed or jailed. For a breakdown of the funds they received from the government prior to their ‘disagreement’, click out this list of Ranching Subsidies. The truth is, ranchers make excellent money. They’re subsidized, funded and protected while horses and burros lose their grazing grounds to an industry known for rampant abuse and abject cruelty to the animals they ‘farm’. If Americans were routinely subsidized the way these wealthy ranchers are, there would not be a financially challenged family inside the boundaries of the United States. Please watch the following video for further evidence.